The Eagles have landed. The Silver Eagles, that is. 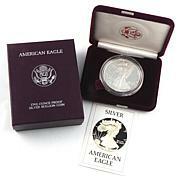 It's one of the most popular silver bullion coins ever issued by the United States Mint. Here's your chance to have the complete 2016 set minted in Philadelphia and San Francisco as well as at the West Point Mint. 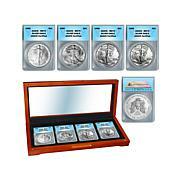 It's a great way to commemorate a special occasion and to collect precious-metal coins. 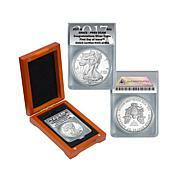 For years, the bullion versions of the American Silver Eagle have been struck only at the West Point Mint. The United States Mint announced that, in 2016, it also produced limited amounts of these bullion silver eagles at the Philadelphia and San Francisco Mints. However, as a United States Mint bullion product that carries no mint mark, there is no obvious physical distinction as to where these 2016 American Silver Eagle Bullion Coins were produced. 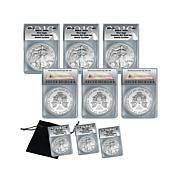 These coins have been graded and certified by ANACS that one of each has been struck at the West Point, Philadelphia and San Francisco Mints. 2016 and 2017 PSW complete mint set. What a wonderful set to own. 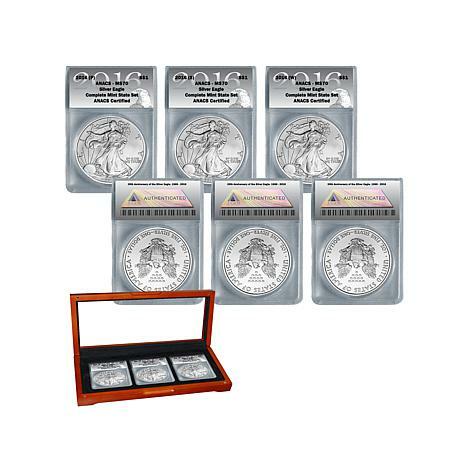 This perfect 2016 coin set is a once in a lifetime opportunity to own. I love mine. I purchased this item and am still within the return period. If you found an incorrect explanation in an article please describe.I found the coins as discribed by Mike to be rare in. mintage by mint location and graded in MS70.Although pricy it is as described. Again referring the the other review if you didn't like them why didn't you return them. This is the only place that offers a return policy of 30 days.I now only hope they will become the investment grade rareity in years to come. Mike should share the letter on this site of the mintage of the 2015, 2016, 2017 Silver American Eagles that he often refers to.Enjoy your purchase.Bill E.
1921 P-Mint MS65 ICG Morgan Silver Dollar "Last Year of Issue"